You will have all the necessary equipment and ingredients to learn the art of preparing some of the most delicious and best known tapas in Spain. 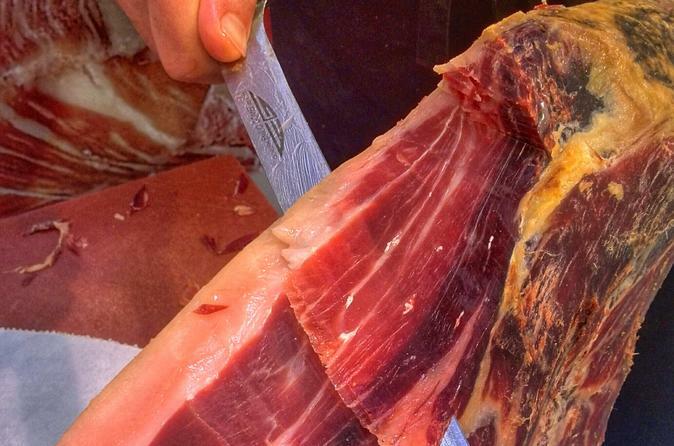 Learn how to cut and serve Iberian ham and taste up to five different types of this national delicacy. You will use some of these meat cuts to prepare a wonderful pan tumaca, the tapa made of bread, shredded tomatoes and Iberian ham. You will continue the cooking experience preparing other typical tapas such as garlic and pepper prawns, oyster mushroom toasts, and fried potatoes with brava and oli-oli sauces. As you finish preparing them, you will have the chance to savor them washed down with a glass of refreshing sangria.